I've been seriously craving some homemade bread lately and when I saw a post the other day for some at A Little Bit of Everything. I knew I had to try it, but I was feeling like sourdough not regular bread dough. I grew up eating sourdough bread and I've tried it before and it was okay, this way came out much better I think. I didn't have any sourdough starter, so I decided to find a recipe for some and see how things went. I consulted one of my old friends, the Better Homes and Gardens cookbook. Combine everything in a bowl and beat it till smooth. Cover bowl with cheesecloth. Let stand at room temperature for 5-10 days or till mixture has a fermented aroma, stirring 2 or 3 times a day. I stored it in the fridge in a jar covered with cheesecloth after day 10. Feeding the starter: Feed after each use or if not used in 10 days, stir in 1-teaspoon sugar. Repeat every 10 days. Feed with 3/4-cup all-purpose flour, 3/4-cup water and 1-teaspoon sugar. After 10 days I made some sourdough bread dough and from there we made our pull-apart loaf. Yes it does smell sour, but don't be alarmed. Also there may be a liquid that forms on top, that is normal, just stir, as long as the liquid isn't brown. Bring sourdough starter to room temperature. Combine 2 1/2 cups of the flour and yeast. Heat water, sugar, butter, and 1-teaspoon salt to 120-130 degrees F. Add to flour mixture. Add sourdough starter. Add to mixer with dough hook. Or mix by hand. Combine 2 1/2 cups of the flour and the baking soda. Stir till combined. Add to mixer and mix till combined. Knead for 5 minutes in mixer. Place into a greased bowl. Cover and let rise till doubled (about 1 hour). Turn out onto a lightly floured surface. Cut dough in 1/2 and then cut 1 of the halves into 12 pieces. Roll each piece into a circle about 6" and fill with a teaspoon or so of pesto and sprinkle with cheese. I used an Italian Cheese blend, but it's up to you. I filled my pieces with an alternating combination of tomato and basil pesto. I was trying to represent for the Red, White and Green! Plus I just really love those flavors. Folded each circle in half and seal with a fork. Place each piece in a buttered 9"x4" loaf pan. Cover the loaf with a clean dishtowel and let it rise about 45 minutes. Brush the top with an egg wash (1 egg and 2 tsp. water). I love to sprinkle a bit of coarse salt on top of the loaf at this point. Bake in 375 degree F oven for 35-40 minutes. Pull it apart and enjoy each piece. Can't you just smell it? Since this recipe made so much dough I had a little fun and made something else with it. You can make two loaves or bake one plain, or even cut this recipe in half if you want. I'm calling it my have-a-heart pull-apart! Figured I'd spread a little love and get you in the mood for Valentine's Day! My heart has a surprise in the middle too! Thanks for all your sweet comments on my post earlier in the week. My point wasn't about what is right or wrong, just make sure and do what is right for you. I believe they call it marching to the beat of your own drum. MMM I'm not a sourdough fan but if there's something in it then YES! :) This looks delicious enough to make! I could go for some with my coffee this morning for sure. I'm so happy you did this recipe. I printed out the same recipe and can't wait to try it. I love that you changed it up to sourdough. Looks so amazing! Great Job!! This looks amazing! This crazy, because I was planning on making the exat same thing only in sandwich form! This just lets me know that I am on the right road tastewise! I must try a pull apart bread one of these days. My doughbabies would love it! WOW Gina, you are good! I love anyting to do with bread and your post today really gave food for thought. wow, your bread looks so good. I'm so jealous. The heart shaped one is adorable. Wow Gina.. Looks too good.. Really not a fan of sourdough but reading your post I felt it must be very delicious !! Never made anything like this before -it looks amazing! My husband saw the pictures over my shoulder and is asking me to make it for him...hope mine comes out looking as good as yours! It looks so great, both you and Roxana nailed this delicious bread! I want some. Your sourdough bread is gorgeous! I never even baked bread, so this recipe. seems a little daunting. I like your heart shaped rolls, too. This looks fabulous! I love the idea of pesto and cheese as stuffing....mmmmmmmm. This is inspired. The filling just calls my name and I shall answer. The photos entice and are just inviting. I'm hungry all over again. This is such a beautiful looking loaf! 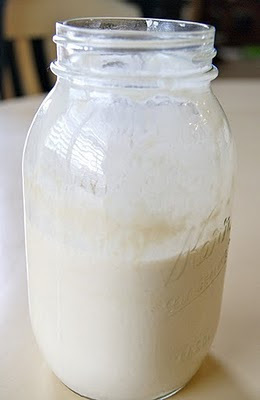 I'm nervous about making my own sourdough starter, afraid I'm not responsible enough to take care of it! Gina - I agree the bread craving is hard to overcome. Your pest pull apart bread looks amazing - sure wish I had a peice right now. Enjoy the upcoming weekend. Yum, yum, yum! I don't know if I'll use sourdough, but I will try this! You made margharita pull-apart bread (it just needs mozzarella) and I absolutely adore that. Boomarking too. The heart is too cute. ;) What a wonderful loaf. The filling looks delicious. This is a great approach in making rolls. I have yet to master a good starter. Yours looks great. Oh my goodness! WOW that looks so great, fantastic idea. The bread is just so beautiful! Thank you for kind words on Chef's Dennis blog! OMG! That is the coolest idea EVER! Make little empanadas and the stick them together and bake and pull! I LOVE this idea!!! Gina-Your sourdough pull apart bread is gorgeous, especially the yummy filling. This is a true "labor of love" ...would love to taste a piece of this, bet it was gone right away! This is such a genius idea! I've never seen anything like it, and I love the end result! I have got to make a sourdough starter too (can you believe I've never tackled that before?) Thank you for sharing, sweet friend. May your Sunday be one of peace and love. I have been thinking about that pull apart bread ever since I saw it, too. It sounds amazing. I love what you did with it. It must be in the weather! Pesto and cheese sound like a great option for the stuffing and using a sourdough starter - Mmm! I'm not a big sourdough bread fan but It's filled with such delicious stuff that I would totally eat a big slice of this! And in any case, all my admiration for making it from scratch. I know that sourdough is a lot of work. if you only want to make rolls with the dough (no filling), how should you do this? @NurseGreene, I would make the dough as instructed, let it rise in an oiled boil for 1 hour. Turn it out onto a floured cutting board, cut the dough into probably about 16 pieces and roll each piece and place it on a baking sheet lined with parchment or buttered, cover with a clean towel and let rise 45 minutes and bake in 350 degree F oven for 20 minutes or so until nicely browned. You could brush the tops with melted butter if you'd like prior to popping them in the oven.